Looks Good from the Back: Adrien: Stripes for Days. If you don't have a striped fit and flare dress, get on that. This Cynthia Steffe option looks super flattering and I love the crazy colors in this Nine West dress. The Gap also has a cute summery version that might have potential. The closest thing I could find to my dress is this one by Kate Spade. Spendy, but super cute. Details! A bold stripe requires a bold necklace, so I'm wearing my chunker of a tassel pendant. It's Lulu Frost for J.Crew and nobody does a tassel quite like Lulu. This beauty is still on sale! Someone buy that. For the more modest budget Kendra Scott does a nice tassel and for under $50, this Rebecca Minkoff is awfully pretty. My watch is an old black studded La Mer wrap that I totally forgot I owned. I used to wear it a lot on the blog. My shoes are Madewell Sidewalk Skimmers in a purply-blue suede. I love them. They don't seem to be carrying the Skimmer style anymore, but the blue suede Lydia flats look pretty amazing. BR also has a blue suede pointy flat that's currently on sale. Ooh, and check out this Marc Fisher pair! That color is closest to my pair. And finally, so I don't freeze to death in the morning, I threw on my excellent Madewell Beckett jacket. Thanks, Marianne! It shouldn't work with this dress at all but I think it does. 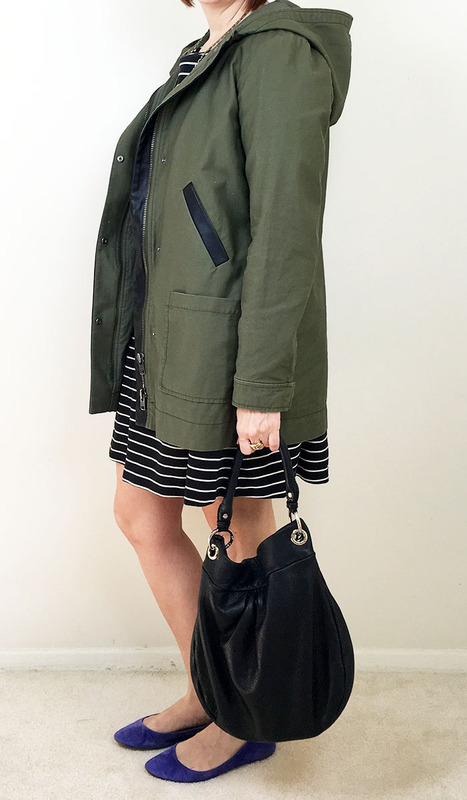 An olive utility jacket is the perfect in-between weather option. The Fleet jacket at Madewell has potential and this Target Merona jacket looks like a great under-$40 option. I don't generally link Forever 21, but damn, this is cute. Oh, and finally, my bag is my ancient Marc by Marc Jacobs Hillier hobo. There's an updated version (on sale here!) but I just keep on carrying my old one. GURL, Madewell has a discount code right now for 30% off sale stuff. The red Lydia shoes are mineallmine.